As Oklahoma teachers declare victory, Colorado educators walk out of class. 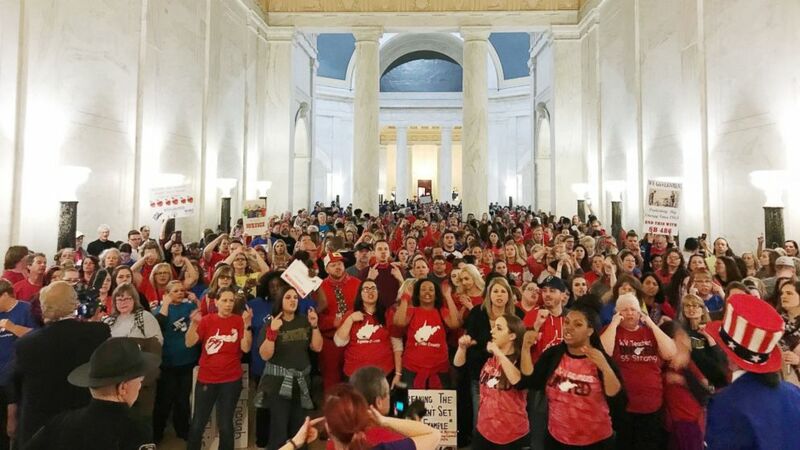 As Oklahoma teachers declared victory and returned to classrooms Monday after a nine-day school walkout, their Colorado counterparts were poised to stage their own labor action as a movement ignited by a successful strike by West Virginia educators continues to sweep the nation. 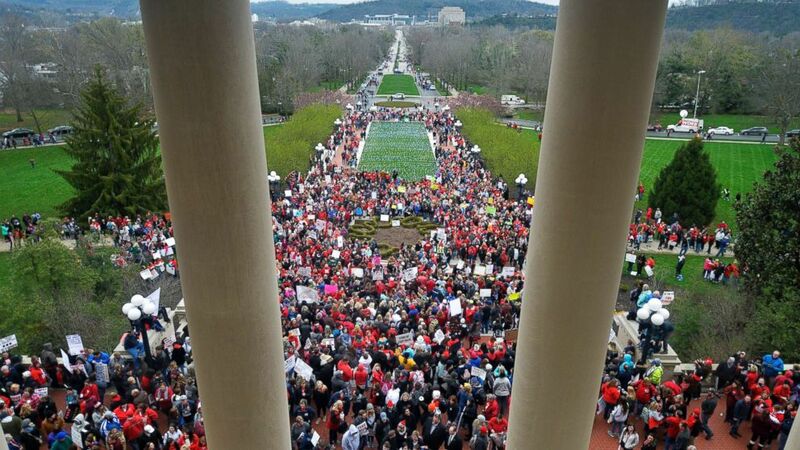 The wave of teacher protests has mostly occurred in states dominated by Republicans in the legislature and governors' offices, such as West Virginia, Oklahoma, Arizona and Kentucky. Colorado, which has a Democratic governor and a Democratic-controlled assembly, is the exception. "We need to make sure there is a big tidal wave of big changes in legislatures nationwide so the public school community can spend their time helping kids succeed, not begging or demonstrating for decent pay and adequate school funding," Randi Weingarten, president of the American Federation of Teachers, said in a statement. Scores of Colorado teachers left their classrooms Monday and descended on the state capitol in Denver for what was billed as a "Day of Action," in which they lobbied legislators to boost their pay and provide more funding for education. The teachers also held a boisterous rally at the capitol this afternoon, chanting, "You left me no choice, I have to use my teacher voice!" "One clear way to value educators is by funding our schools. Legislators are working with a positive state revenue forecast in this session -- they have substantially more money at their disposal this year to invest in educators and our students," the Colorado Education Association said in a statement. 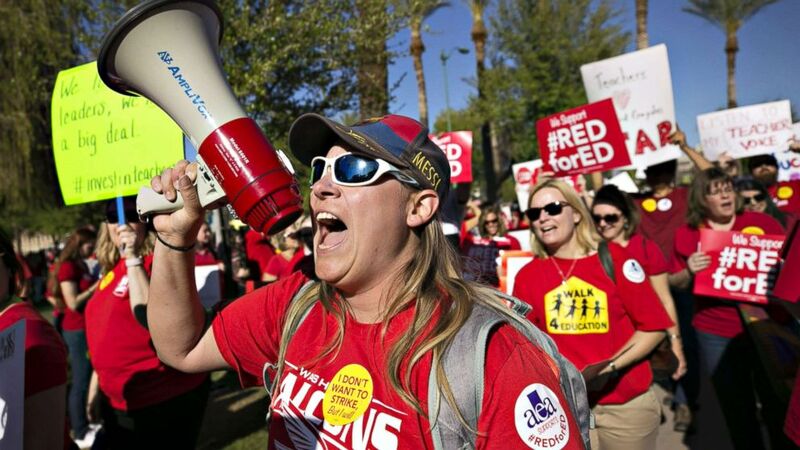 (David Wallace/The Republic via USA TODAY NETWORK) Lindsay Breon, a Physical Education teacher at Washington Elementary School in Phoenix, shouts into a megaphone while rallying to support teachers during a #RedForEd rally at the Arizona State Capitol, in Phoenix, March 28, 2018. Teachers in Colorado earn about $7,000 below the national average of $58,064 a year, according to a survey by the Colorado School Finance Project, a nonpartisan, nonprofit education watchdog group. The survey also showed that teachers spend an average of $656 annually out of their own pockets on classroom supplies, including pencils and binders. Oklahoma teachers were heading back to classrooms after staging a nine-day walkout, in which they filled the state capitol building in Oklahoma City to demand the restoration of funding for education they say has been drastically reduced over the past decade. (Sue Ogrocki/AP) Surrounded by teachers and legislators, Oklahoma Gov. 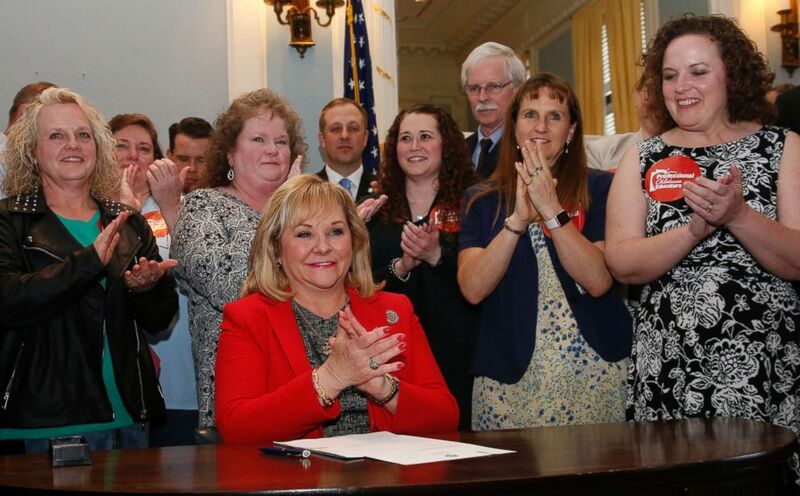 Mary Fallin applauds after signing a teacher pay raise bill in Oklahoma City, March 29, 2018. 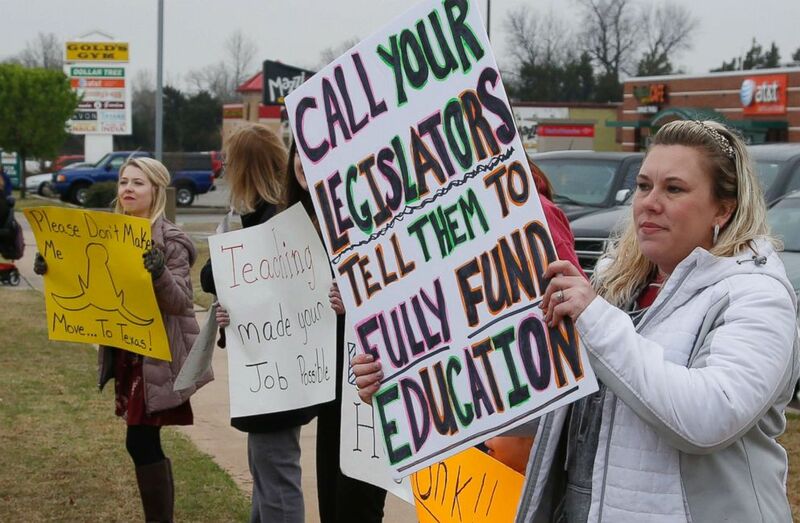 The Oklahoma Education Association said the walkout prompted legislators to boost education funding by $479 million and up teachers' pay by an average of $6,100, the largest pay raise in state history. The teachers also won pay raises for support staff such as cafeteria workers and bus drivers, and secured $70 million in recurring revenue for classroom supplies. "You have achieved a historic victory for our students ... the biggest financial victory in history for our students," Alicia Priest, president of the Oklahoma Education Association, told her members as they decided to end their nine-day walkout on Thursday. But Preist said the efforts by teachers to win more money for education is not over. She said teams of educators from around the state will continue to go to the capitol to lobby lawmakers for more education funds. She also implored teachers to focus on unseating lawmakers who voted against raising funding for education. (Sue Ogrocki/AP) Teacher Adrien Gates pickets with other educators on a street corner in Norman, Okla., March 27, 2018. "We must work harder than ever to elect education champions who will put students first," said Priest, adding that a number of OEA members a planning on running for the state legislature. "This fight is not over just because the school bell will ring once more; we have created a movement and there is no stopping us," Priest said. Teachers in Arizona are voting this week on whether to stage a classroom walkout, after previously conducting several walk-in protests in which they demonstrated outside their respective schools before walking in with students to conduct classes. The Arizona teachers are demanding a 20 percent pay hike from an average of $43,280 a year for elementary school teachers and annual pay of $46,470 for high school teachers. The teachers also want more money for support staff and for lawmakers to restore $1 billion in cuts to education over the last decade. 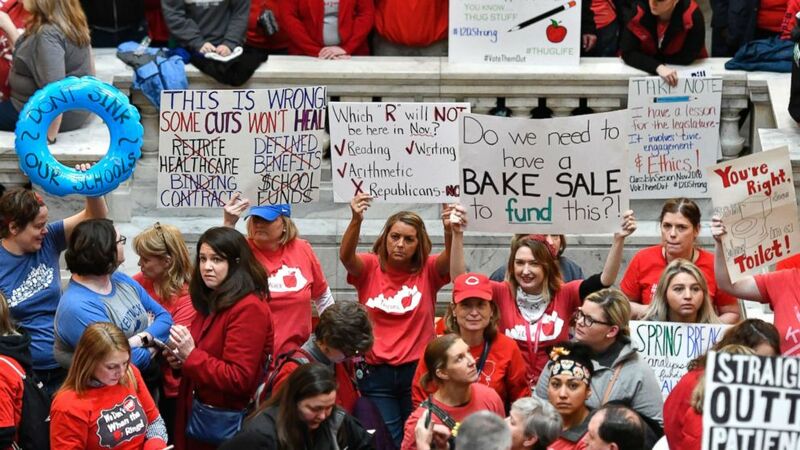 (Timothy D. Easley/AP) Teachers from across Kentucky hold up signs as they fill the state Capitol to rally for increased funding and to protest last minute changes to their state funded pension system, April 2, 2018, in Frankfort, Ky.
Arizona Gov. Doug Ducey, a Republican, floated a proposal last week to meet the teachers' 20 percent pay hike request with a 9 percent raise this year and an 11 percent raise in 2020. Although the governor promised not to use "shell games" to cover the cost of the raise, teachers' union officials said they remain skeptical because Ducey has not detailed how he will pay for it. Kentucky Gov. Matt Bevin apologized on Sunday to "those who were hurt" by comments he made about children being at risk for sexual abuse and drug use while teachers walked out of classrooms on Friday and protested at the state capitol in Frankfort. (Timothy D. Easley/AP) Teachers from across Kentucky gather outside the state Capitol to rally for increased funding and to protest changes to their state funded pension system, April 2, 2018, in Frankfort, Ky.
Kentucky teachers are also upset over Bevin's plan to overhaul the state pension system and prevent them from putting accrued sick time toward their retirement. On March 30, so many teachers staged a "sickout" that 29 school districts were forced to cancel classes because they couldn't find enough substitute teachers. “I guarantee you somewhere in Kentucky today a child was sexually assaulted that was left at home because there was nobody there to watch them,” Bevin told reporters Friday. “I guarantee you somewhere today a child was physically harmed or ingested poison because they were home alone because a single parent doesn’t have any money to take care of them. (Robert Ray/AP) Teachers celebrate after West Virginia Gov. Jim Justice and Senate Republicans announced they reached a tentative deal to end a statewide teachers' strike by giving them 5 percent raises in Charleston, W.Va., March 6, 2018. “Some were introduced to drugs for the first time -- because they were vulnerable and left alone,” he added. Bevin's said his comments were roundly criticized by both Republicans and Democrats in the legislatures. Bevin said people misunderstood his statement. Kentucky legislators voted on Friday to override Bevin's veto of a two-year state budget that increased education funding through a $480 million tax increase. The teacher labor movement began earlier this year when West Virginia educators went on strike for nine days. The strike ended March 6 when Republican Gov. Jim Justice signed the bill granting a 5 percent pay raise to all state employees. The success of West Virginia teachers inspired educators in the other states to follow suit. "West Virginia woke us up," Joe Thomas, president of the Arizona Education Association, told cheering teachers at a rally in Phoenix last month.